This post continues a series of examples on Advanced Expression-Based Filters for Metacoda Plug-ins. 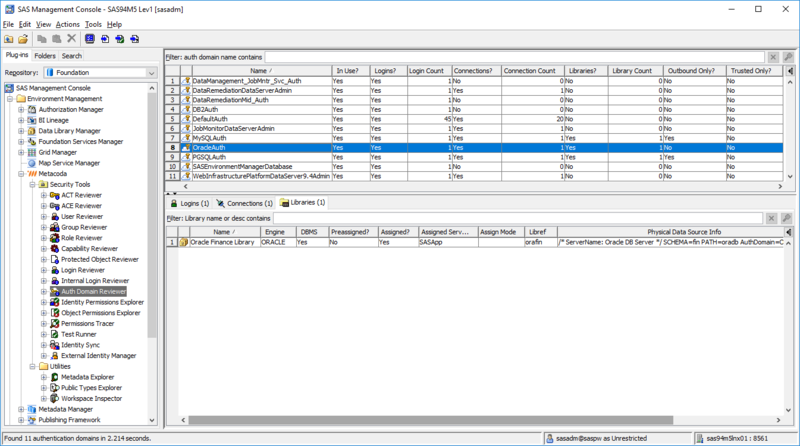 The recent Metacoda Plug-ins 6.1 R2 release added support for a new hasPermissionCondition boolean attribute that can be used in any filter bar on a table of Access Control Entries (ACEs), such as the ACE Reviewer. If you have any questions about Metacoda Plug-ins, Advanced Expression-Based Filters, or hasPermissionCondition please leave a comment below. 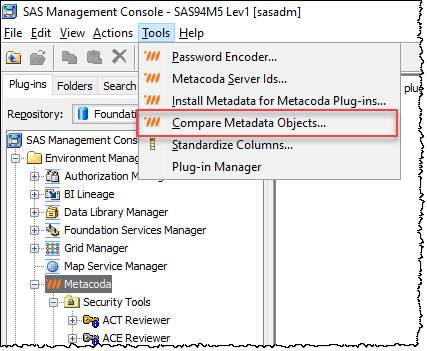 One of the new additions in the recently released Metacoda Plug-ins 6.1 R2 is a Compare Metadata Objects feature. This is a something that several customers have requested, particularly for the comparison of SAS metadata security objects like ACTs, Users, Groups, and Roles. One of the most common requests was to be able to compare users, who are supposed to be almost identical, but are found to have different access. Being able to compare the two users to see which groups they have, or don’t have, in common helps to speed up troubleshooting. With the new Compare Metadata Objects dialog, you can compare any two metadata objects to show similarities and differences. Whilst it can be used to do a basic comparison of any 2 metadata objects, specific attention has been given to aid in the comparison of security objects, including ACT Permission Patterns, ACT and ACE participation, applied ACTs and ACEs, user/group membership of groups and roles, and members of groups and roles. Last year I posted some information about a new Metacoda Auth Domain Reviewer plug-in that was planned for Metacoda Plug-ins 6.1. That Auth Domain Reviewer is now available with the recent Metacoda Plug-ins 6.1 R1 release and you may notice that it looks a little different to the screenshots I posted back then … it now has a Libraries tab. The Libraries tab as was added based on feedback we got during early access testing by customers. They told us they would like to be able to see, for a selected authentication domain, all of the SAS® software libraries registered in metadata that are associated with that auth domain. That sounded like a great idea so we added it! Thanks to those customers that suggested it and please keep those suggestions coming! If you’d like to try out the new Auth Domain Reviewer plug-in you can login and download Metacoda Plug-ins 6.1 R1 from the Metacoda Customer Portal. If you don’t yet have a Metacoda login you can register for a free 30 day evaluation license to try the plug-ins in your own SAS platform installation. This tip was prompted by a SAS Communities question which I hear from time to time, essentially “How do I find out which groups a SAS user is a Portal Group Content Administrator for?” It can be answered using the Metacoda Identity Permissions Explorer but involves a few steps so I will outline them here.